We have developed the CX1000/CX2000 control and measurement stations, which implement a PID control function based on the functions of the DX100/DX200 paper-less recorders. The CX series has up to 6 embedded control loops and 20 channels of analog inputs. With the Yokogawa M&C Green Series Controllers connected through a communications interface, the CX series is able to control up to 16 additional external loops. In addition to the DX series' main functions, such as recording and/or monitoring display and communication via Ethernet, the CX series has also employed new functions such as monitoring display for control loops, control operations, and ladder communications for PLC. This paper outlines the key features of the CX series. The rapid evolution of information technology (IT) has made possible the transmission of a wide range of information in a short period of time, resulting in the transformation of society in aspects such as logistics and business styles. During this transformation, quick assessment of the circumstances and prompt actions were also required in the production lines, making real-time collection of field information indispensable. To meet these kinds of demands, changes have also been taking place in small-scale simplified instrumentation. For instance, examples combining the use of PLC (programmable logic controller), SCADA (supervisor control and data acquisition), etc. have been on the increase in comparison with combinations of recorders and temperature controllers, which used to be in the mainstream for the long term. For these PLC/ SCADA type systems, there is flexibility in that they can be used in a wide range of fields as well as the fact that they are capable of transmitting field information. Conversely, they require engineering such as program development, even in simplified instrumentation, which results in a cost increase. With this background, we have this time developed the CX1000/CX2000 control and measurement stations which are of the network-capable type, and which save you from having to do programming and realize monitoring, control, measurements, and recording by simply installing wiring and making menu-driven simple settings. Figure 1 shows the appearance of these stations. An example of system configuration using a CX2000 is shown in Figure 2. 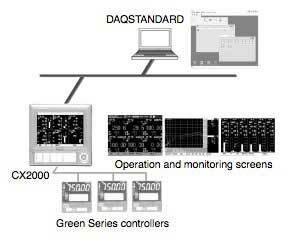 The PID control algorithm of proven Green Series digital controllers of Yokogawa M&C has been imported. The Green Series digital controllers can be connected through a communications interface, allowing internal controller settings to be acquired automatically. For external PID control, the CX series offers the same monitoring and operation capabilities as those with internal PID control. The CX series is equipped with Ethernet as standard, allowing the use of network functions such as Web server, E-mail, and FTP (file transfer protocol). The CX series makes full use of the hardware resources of the proven DX100/DX200, enhancing the commonality of equipment. 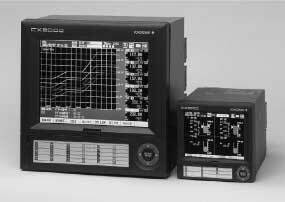 In developing the CX1000/CX2000 stations, the control output function, not provided for the DX100/DX200 recorders, was the main design objective. Figure 3 shows the configuration of the CX1000/CX2000 control output functions. The overall functions shown in Figure 3 are contained in a single module called a control output module. Each control output of the current output, voltage pulse output, and relay contact output is provided for two loops, and each loop is isolated from the other. Moreover, each control output has a fail-safe function that stops control action in the event of an abnormality in the CX1000/CX2000's internal systems and outputs preset values. The DI/DO section has six contact inputs (DIs) with the input type of no-voltage contacts or open collectors (TTL or transistors) and six contact outputs (DOs) making up two relay contact outputs and four transistor outputs. For the CX2000, three units of this control output module can be installed to control up to six control loops. The interface to the CPU uses a newly developed gate array to control various control outputs. 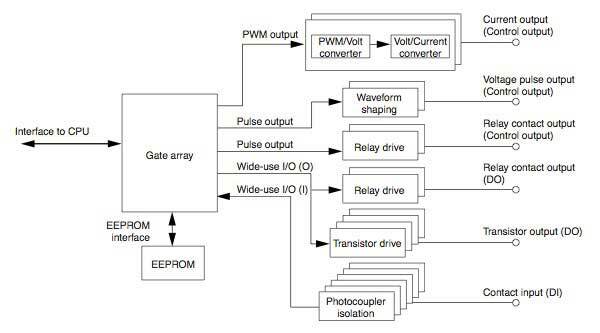 This gate array has a pulse output function, a PWM output function, a wide-use I/O function, and an EEPROM interface. 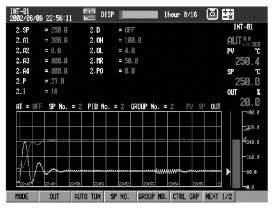 The pulse output function produces time proportioning pulse outputs, which are used for control outputs of voltage pulse output and relay contact output. The PWM output function is used for current output, which is processed by a PWM/ voltage converter at a later stage to output constant currents. The wide-use I/O function is provided with I/O ports of 6 groups of 4 bits each, 24 bits in all, which can be selected for inputs or outputs on a group basis. The DI/DO section is implemented using these I/O ports. DO Contact Output Processing: Alarm output, Fail output, etc. The CX series incorporates unaltered the conventional recorder-providing screens, such as the Trend screen provided for the DX series, and comes with new Faceplate, Tuning, and Control Overview screens that are suitable for the operating and monitoring of control, to display control statuses graphically. Because the CX series has these screens as standard, they can be used by simple setups without complicated engineering such as screen configuration (see Figure 5). Moreover, these screens can be used as operation and monitoring screens (HMI, or human-machine interface) for controllers connected through a communications interface. The use of this HMI provides a seamless environment for the CX series' built-in control function and also for the function of controlling the external controllers. Moreover, the CX series is equipped with a "Program Operation screen" as a screen dedicated to controlling and monitoring program operations. 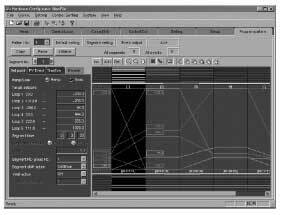 During operations, this screen arranges the profile of preset setpoints and the recorded process values in time series to display them in a superimposed condition. This allows you to monitor in real-time if operations have been performed as expected in the profile. Thus, the screen takes advantage of a merit into which control and recording are integrated (see Figure 6). The CX1000/CX2000 stations have the same network functions as the DX100/DX200 recorders, upon which they are based. For Ethernet communications, the CX series is equipped with TCP/IP as a communication protocol and has a dedicated command-based data transfer function with respect to a higher- level host. In addition, the CX series comes with Web server, FTP, and e-mail functions to implement Web browser-based data monitoring on an intranet, file transfer, and e-mail-based notification of alarms or changes in system status. It also has an RS-232C/-422 interface option, allowing data transfer through the Modbus protocol using dedicated commands. 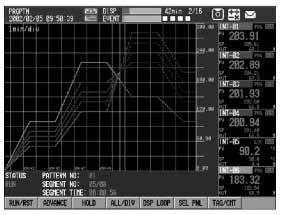 In the CX1000/ CX2000, each piece of data from the control loops is added as data for communication, so that this data is handled in an equivalent manner to measured/calculated data of the DX series. In addition to the functions provided for the DX series, the CX1000/CX2000 are equipped with a function for communicating with Green Series controllers through the RS- 232C/-422 interface and Modbus protocol, and with the ladder communication function implemented for the Green Series. The former has the function of automatically identifying the models of the connected Green Series controllers to simplify setups in CX, so that data and alarm information from the Green Series can be collected easily. The latter facilitates the creation of ladder programs on a PLC for communications with the PLC. This function has allowed the implementation of CX operations from PLCs, such as the acquisition of each piece of CX channel data, the setup of alarm values in CX, the execution of control, and memory start-up. The CX series offers the "DAQSTANDARD for CX" software as standard. This software is packaged with Hardware Configurator with a hardware setting function, and Data Viewer with a data display function. The Hardware Configurator allows you to receive the setup contents of CX1000/CX2000 via network or using media such as a floppy disk and to browse and/or edit them. It also allows transmission of edited setups to hardware to make settings on the hardware side. Figure 7 shows the Program Pattern Segment Setup screen as an example of the Hardware Configurator. This screen has been organized so that an editing pane for setting items is on the left and a pane for graphically displaying setting contents is on the right. This screen shows each set value of the setpoints, PV events, time events, and repeat actions, reflecting them in the segment drawing area on the right at timing of user editing. This allows the user to visually perceive and edit an entire program pattern, something which is originally difficult to understand by mere settings on the hardware. A program pattern is displayed in line segments, and it is possible to switch between two methods of display: segment- based display and display using segment time. The user can edit, delete, or insert items to the selected segment. For time event display, the status in which an event has occurred is filled in with blue, visually representing the relationship between the ON/OFF status of an event and the elapsed time of a segment, making it easy to understand intuitively. Also for repeat action settings, the range of segments where a repeat action occurs is color coded to facilitate the user's understanding. This paper has introduced the characteristic features of the CX1000/CX2000 control and measurement stations. We anticipate that this new series, as uncomplicated IT era controllers that realize monitoring, control, measurements, and recording by simple setups, will contribute to the introduction of information technology to simplified instrumentation. The product names, titles, or software names in this report are generally trademarks or registered trademarks of their respective holders.